We recently hung this Mariner’s Compass in my husband’s study. I made the quilt with him in mind. The fabric was bought on a trip to Bermuda, maybe spring of 2005. I always wanted him to hang it somewhere, but not until the new apartment did that wish get fulfilled. 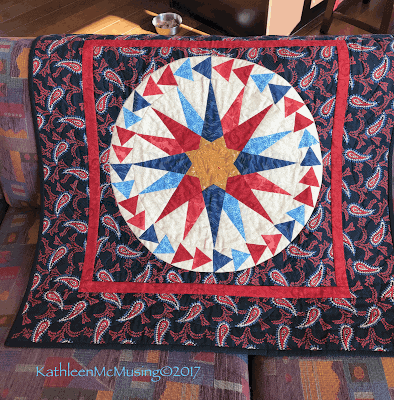 I was able to take a class with with Judy Matheison, the master of the mariner’s compass block, in November 2005. 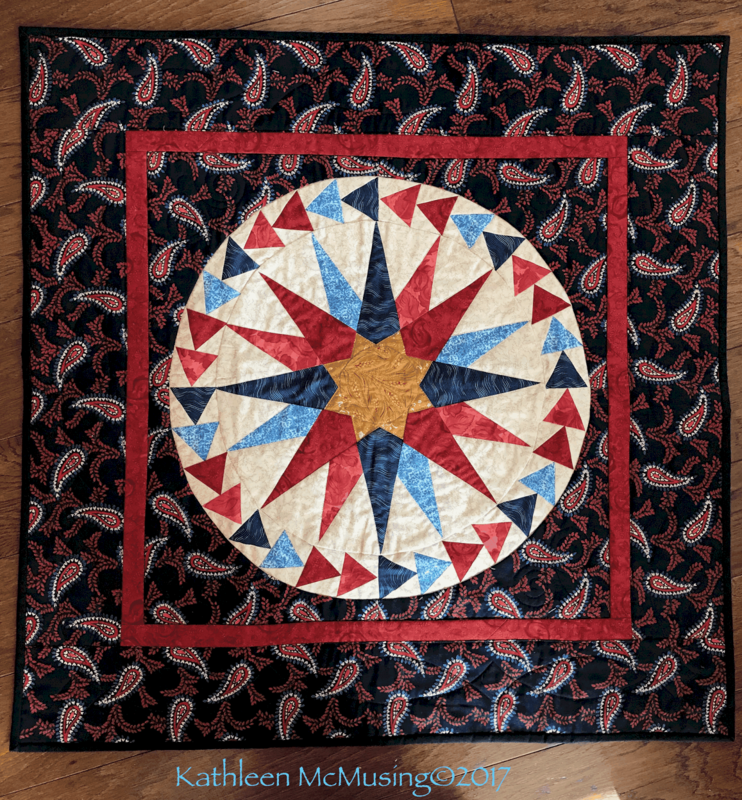 The quilting follows along the lines of the compass. 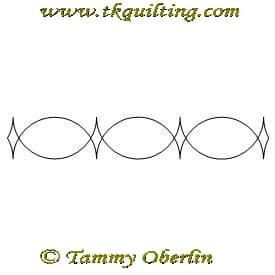 In the border, I used a stencil with an egg and dart pattern – maybe not this exact one and a frond in the corners of the block. This is early in my machine quilting days but it certainly was enough to make it work, and holds the quilt together nicely. I loved the fabric on the back and in fact, and had a friend get some in San Francisco on one of her trips. 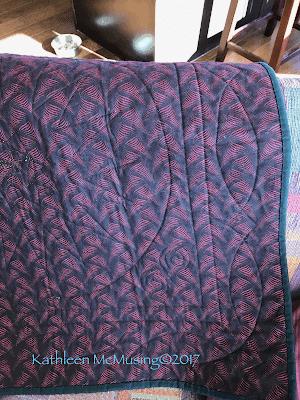 I do love the quilt and am pleased to show you an old but favorite block/quilt. Previous Post Organized!!! – Another Finish for the 4th Quarter! Very silly, but I figured it out. To get to Bermuda from Boston it is 770 miles SE! It was bugging me, too. I think that is both fun and hilarious that you have a mystery to solve that you unintentionally created! 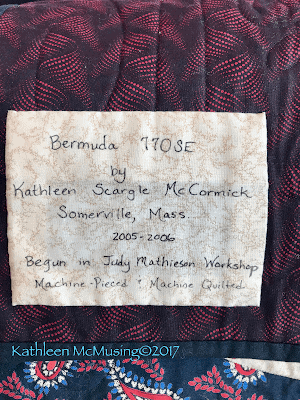 This is a beauty and to have had the opportunity to take a class with THE Judy Mathieson—! I love that backing too—I believe I have it in black and JUST used it the other day in my Splash of Colour QAL (which isn’t making the deadline). Paula Nadelstern, I think? No selvage left on it. Hilarious it is! I did finally figured it out after yoga this morning. To go to Bermuda from Boston it is 770 miles SE! I will have to check the selvage when I get home (in snowy soon to be rainy Maine). I am taking a Paula Nadelsstern class in March…so excited. It's nice to have a quilt you love finally hanging up, isn't it? I love that you used a print for the background, it gives the quilt such a nice gentle flow. Have safe travels back to Maine! Thanks, Rose. Traveling home from Maine tomorrow and then not back up until after Christmas. Am ready to be in one place for 10 days! Beautiful quilt and I bet it looks great on the wall. I have always liked Mariner's Compass blocks (all things pointy, y'know). This is such a pretty quilt, and I'm so happy you now have it on display. Glad you figured out the mystery! Love the flying geese around the mariner's compass! Nice to have a home for it.